What has society come to when we proclaim our love with a Sharpie instead of a pocketknife? Used to be "Our Love" was etched in stone, lasting forever and ever, amen. Then we moved to carving "Our Love" in living trees, where it would last a generation or until Big Business cleared the lot to build mini-mart. 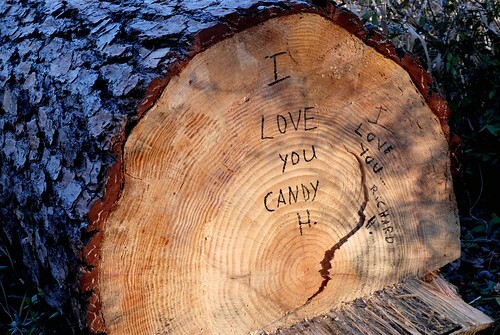 Now, Candy and Richard prove "Our Love" is Sharpied on felled trees, destined to last until someone marks it out with a bigger Sharpie.